Renschler, left, pictured with Daimler CEO Zetsche. FRANKFURT -- Veteran Daimler executive Andreas Renschler, who quit his post as production chief at Mercedes-Benz, may move to Volkswagen Group to head its trucks business, according to a German newspaper report. Renschler has received ''an attractive job offer'' from another German automaker and was likely to take charge of VW's trucks business, which also includes Sweden's Scania and Germany's MAN, the Stuttgarter Zeitung said today, citing company sources. Renschler oversaw Daimler's truck business for almost nine years, managing the division's investments in emerging markets such as Russia and India before becoming Mercedes production chief last April. 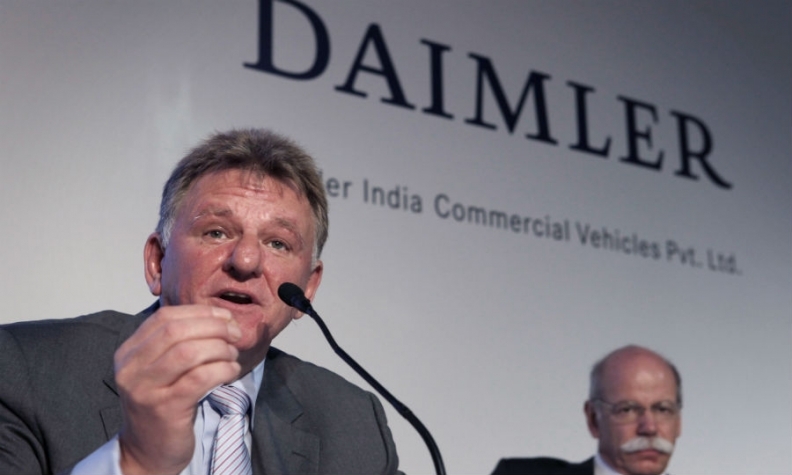 In a statement on Tuesday, Daimler said Renschler, 55, was leaving the company "for personal reasons" with immediate effect. He will be replaced by Markus Schaefer, who is head of production planning at Mercedes passenger cars. Schaefer, 48, used to run the carmaker's U.S. plant in Vance, Alabama. Daimler said Renschler's departure was by "mutual consent" and "unanimously" approved by the supervisory board. Arndt Ellinghorst, an analyst at ISI Group said: "Given Renschler left of his own will, it needs to be seen where he turns up next. Maybe the right man to sort out Volkswagen Group's trucks assets." VW's truck, buses and van units have 35 billion euros ($48 billion) of commercial vehicles sales, similar to Daimler, the world's No. 1 truck maker, whose commercial vehicles sales are about 44 billion, ISI Global analysts said. "The question why Renschler is leaving is easy to answer. In our view his move from head of Daimler trucks to running Mercedes production was a step backwards," ISI analysts said in a note on Wednesday. "Volkswagen could be interested bringing in Renschler to run VW's trucks businesses." Two sources at Volkswagen said they had no knowledge of a job offered by VW to Renschler. Volkswagen declined to comment. Volkswagen's management in Wolfsburg is growing frustrated with a lack of progress forging a truck alliance designed to reap cost savings and take on Daimler, two sources at VW group familiar with the matter told Reuters. A clause in Renschler's contract prevented an immediate such switch to a competitor, a Daimler spokeswoman said. Renschler, an executive board member of Mercedes parent company Daimler, had been seen as a potential candidate to succeed CEO Dieter Zetsche. Renschler told the Wall Street Journal that he decided to leave for "a lot of reasons," including that the contenders for Zetsche's job "are all more or less the same age. If Dieter wants to work for six years, I would not be happy to do my job." He plans to take time to consider his next step, the paper cited him as saying. Renschler swapped jobs with former Mercedes production chief Wolfgang Bernhard, who took charge of the Daimler truck division that includes the Freightliner commercial-vehicle brand in the U.S. and Fuso in Japan, in addition to Mercedes-Benz heavy vehicles built in Europe and Brazil. Zetsche and his predecessor Juergen Schrempp both worked in the commercial-vehicles division before becoming CEO. "With Renschler gone, there's one candidate less to succeed Zetsche as CEO," said Frank Schwope, an analyst with NordLB. "Bernhard is not the only remaining option. Bernhard has not always been uncontroversial and there's the powerful bloc of employee representative to consider." Renschler took on the production job as part of a broader executive reshuffle which saw Zetsche's contract extended by only three rather than five years. His departure tightens Zetsche's grip on Daimler. "The latest move means Zetsche's position is uncontested," a Daimler staffer, who declined to be named, said on Tuesday. The issue of succession at Daimler won't become acute until closer to 2016, when Zetsche's contract expires. Bernhard is still seen as a contender to get the top job at Daimler but his tough management style has met resistance among members of the company's powerful labor unions, which control half the seats on the supervisory board.